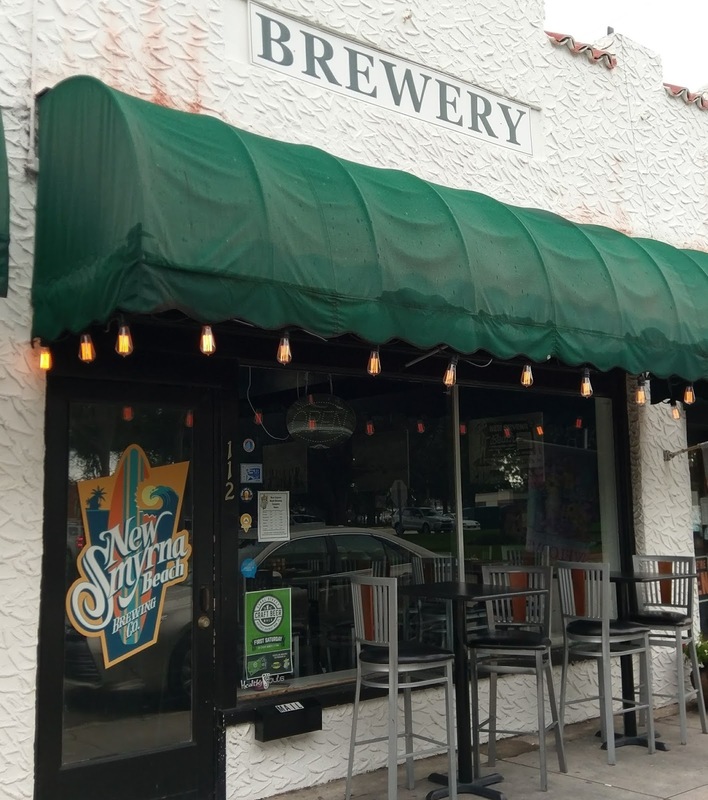 When the last beer is served, and the doors close Friday night (June 16) at New Smyrna Beach Brewing Co. on Sams Avenue in downtown New Smyrna Beach, it will be a historic chapter in the young life of the popular neighborhood brewery. 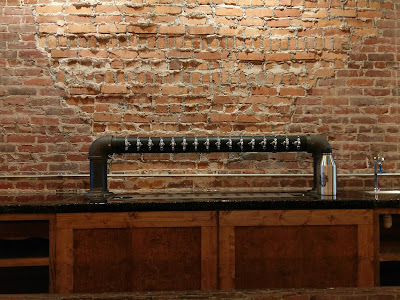 When Owner and Brewmaster Chris Coyle opens the doors on Saturday, June 17, it's sure to be an exciting, yet bittersweet, moment, as the brewery switches operations over to its new location just around the corner at 143 Canal Street. Preparations for the move have been in the works for months. 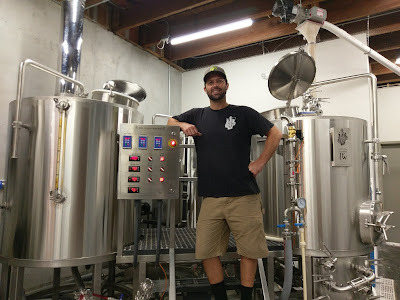 Chris has been one busy guy: moving equipment, building the new tap room and brewery, keeping the existing brewery running, and, of course, brewing beer! 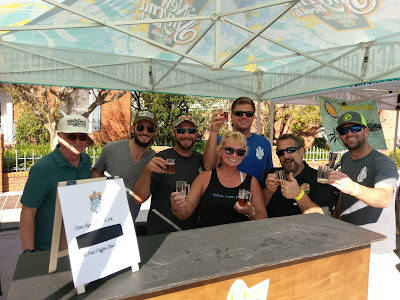 This writer first visited the brewery in 2014, a few months after it opened, then made a return visit, and it has turned out to be a fairly usual stop on the way back from events in South Florida. There's a pretty good combination here that keeps people coming back: good beer, good people! Plus, I like getting that cool blue growler (or two) filled and chatting with manager Jeff. Chris took some time out of his hectic schedule to show me around the new place this past week, and it's quite a bit different in a number of ways. First, there's the size: the original space measures around 900 sf total, with a bar, the 3.5-barrel brewhouse, and one bathroom. 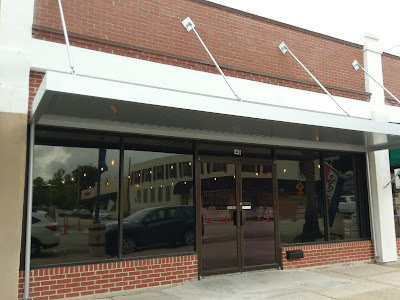 When those doors open Saturday at the new digs, customers will have plenty of space to move around in the 3000-sf place, about half of which is tap room space. Just look at all that space! A former law office has been transformed into a brewery and tap room. The two brick walls on either side were already there, along with a couple of skylights. Demo work started last summer. Chris and a few family members handled much of the interior work themselves. Take a closer look at the seatbacks along the wall -- those are made from barrel staves. And, the bar is lined with barrel tops and staves. 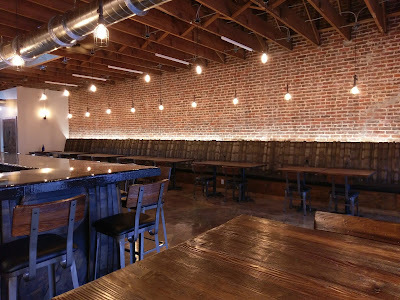 The wall area alone seats more customers than the entire tap room at the original location! 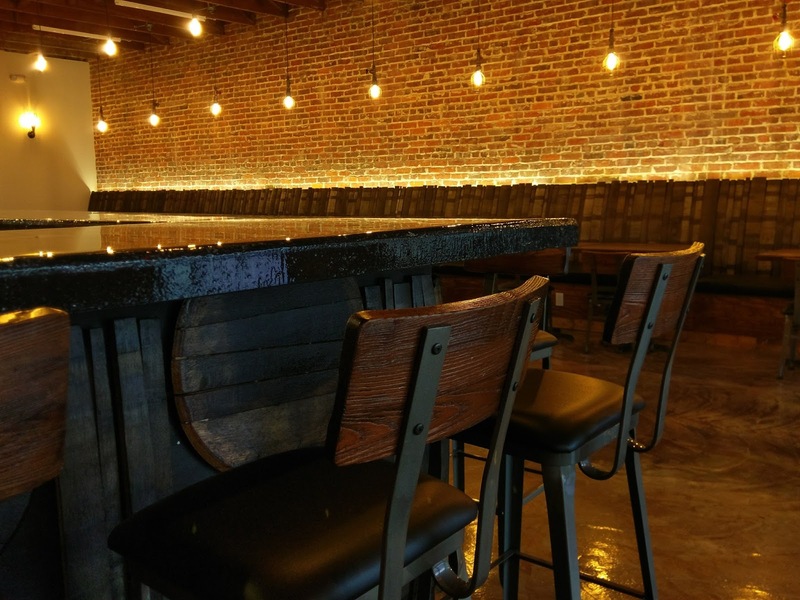 The 30-foot bar, which seats 19, is concrete with a black epoxy topcoat. 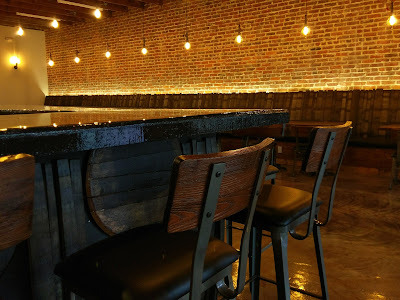 A standing bar featuring whiskey barrel tops is planned for the middle of the tap room. A menu board and merchandise display will be added to the main bar area, and the "Buy a Friend a Beer" board will make the move. That ladder in the below photo will be used to access the Mug Club glassware. Rounding out the seating options will be a couple of outside picnic tables, which will provide a cafe or sidewalk experience along Canal Street. And, let's not forget about those restrooms -- the new tap room has three! (yes, that's applause being heard out there). 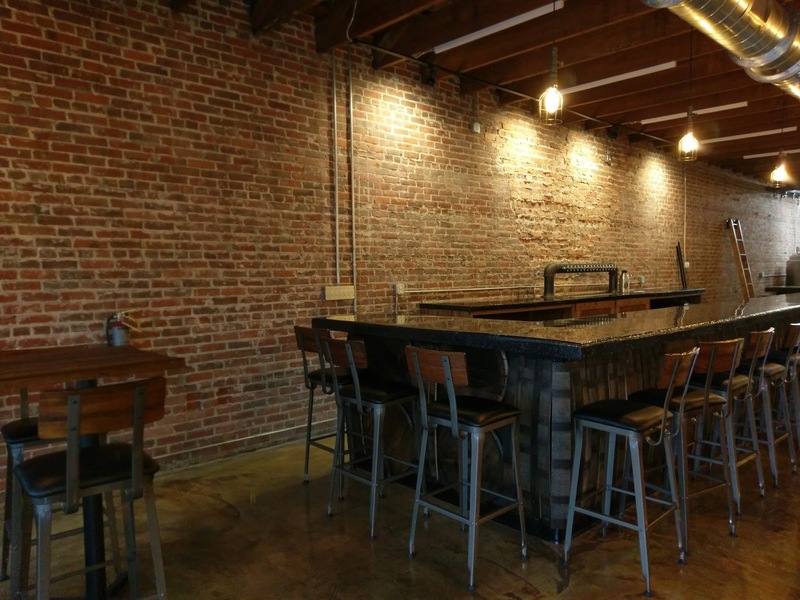 The tap room has an industrial/rustic decor, which complements the brick walls. The light fixtures are metal. 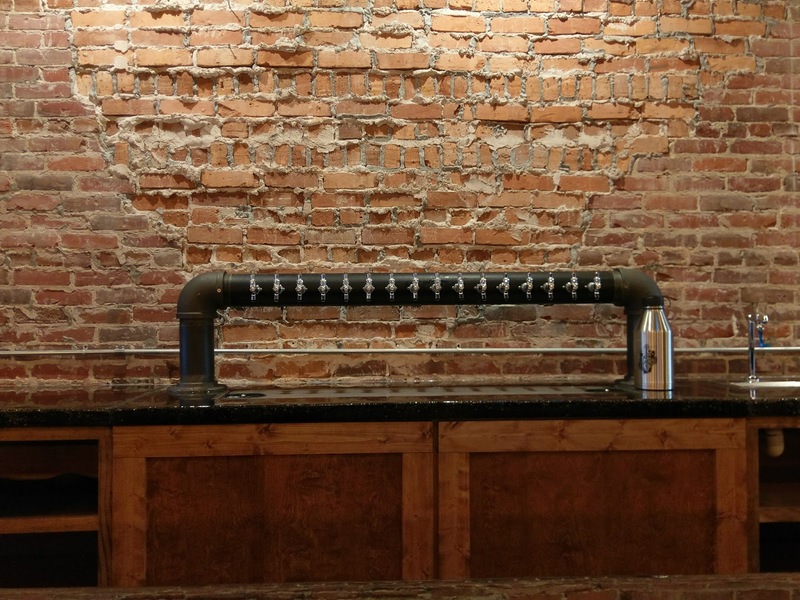 Getting up close and personal with that bar, the draft tower holds 16 taps which will pour house beers along with the house-made root beer. 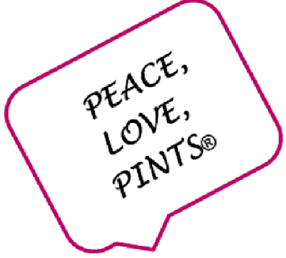 Chris plans to have around 8 beers on tap for the soft opening on June 17. In a somewhat nice problem to have, Chris explains that the original location "got us going," but that he knew that the brewery had to grow to stay competitive. The tap room was always busy, he adds, with customers commenting that there simply wasn't enough space. And, he wanted to separate the brewhouse from the tap room - in the original location, the brewing equipment sits behind the bar. Often getting to work around 4am to brew and finish up by the time the tap room opened due to noise and temperature while brewing, he is looking forward to the larger brewhouse, which has better climate control (and probably not getting there that early). The new brewhouse from Portland Kettleworks is a five-barrel system with three 10-barrel fermenters, and room for a few more fermenters down the line. It also is capable of brewing smaller batches for one-offs and experimental brews. Last fall, Chris travelled to Portland, tested things out, and made a few tweaks before taking delivery. This is one happy guy: his efficiency on the new system is "going through the roof," with a much more vigorous boil, among other aspects. 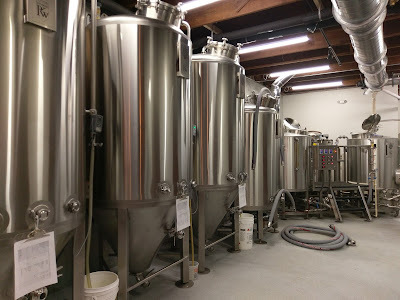 The brewhouse also has new grain milling equipment, and a new 10x20 walk-in cooler to store all those kegs of beer (the original location had a 6x6 cooler and was just a bit tight). 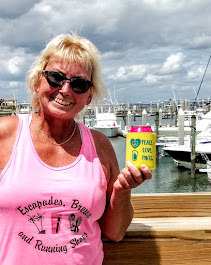 As for the beer? The first beer brewed on the new system is an American Golden Ale, still to be officially named. 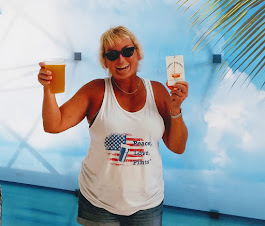 Of course, Chris could have brewed one of the brewery's core beers, but he decided to be somewhat adventurous and go with a brand new style for the inaugural brew. It's in the fermenter and will be available in the tap room in a couple of weeks. Also in the fermenters are Peach Blonde Ale and Feeding Frenzy Irish-style Red Ale (one of the core beers here). 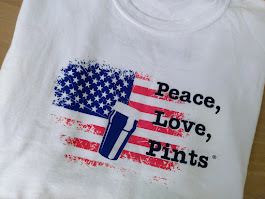 When asked what he will brew next, there was a long list, including more new styles that haven't been offered here before (Pilsner, Red IPA, Russian Imperial Stout, Kolsch, to name a few; slow down, Chris). A New England IPA will be brewed this week, followed by the tantalizing Chocolate Peanut Butter Porter and Black IPA. In addition, he'll brew the Oktoberfest lager soon, which has an eight-week lagering period (they throw a huge Oktoberfest party each year). But, wait, did he say Black IPA? That roasty concoction is one of my favorites here. 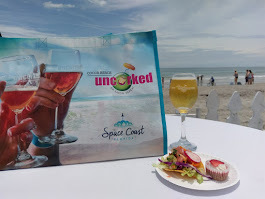 The core beers include Coronado Beach Cream Ale (a go-to that's been in my growler a number of times); Shark Attack IPA (a citrusy American IPA; it's also seen that growler); and Feeding Frenzy Red Ale (think Irish Red, malty and toffee-like; also a favorite). But, did he say Black IPA? 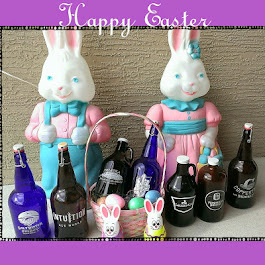 Chris on far right, with more brewery characters. A couple of weeks ago, I again visited New Smyrna Beach Brewing on the way back to North Florida from an event. It will be a bit sad not to stop at the original brewery next time, but at the same time, it's exciting to see the expansion happen (and, the new home is pretty awesome). 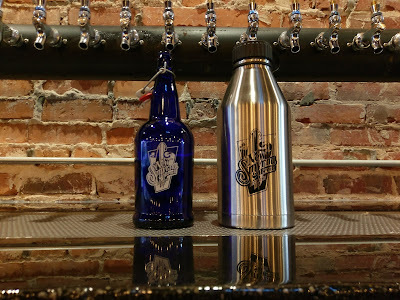 Growler fills at original brewery. It was great talking to Chris about the new place and also meeting Sara, Chris' wife and co-owner. Chris was again quick to point out (see the first story) that Sara is the real owner, and that he merely "plays with beer." Hey, it works! Afterward, one last growler fill at the little brewery. Next time, I'll have to remember to fill that growler around the corner. 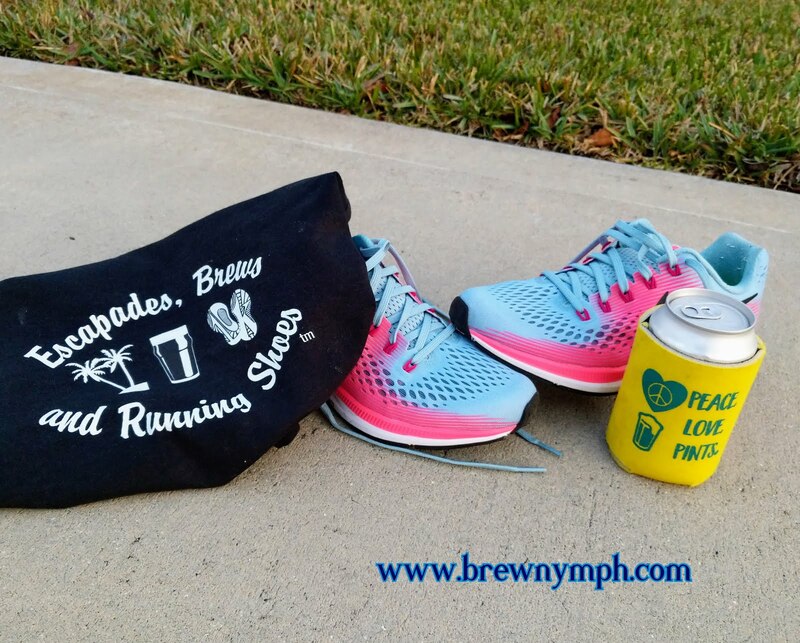 New Smyrna Beach Brewing Co. opens its new location on Saturday, June 17 at 1pm, with a soft opening. A Grand Opening celebration will take place on Saturday, July 1. 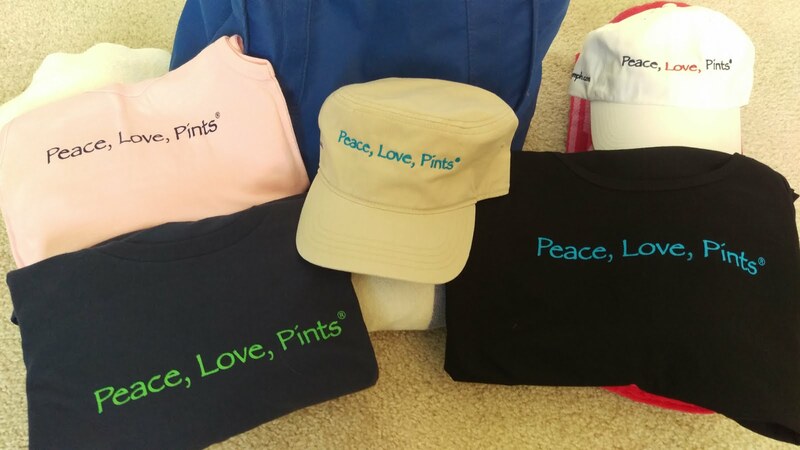 And, look for those beers currently in the fermenters to be on tap. Dogs will also be welcome in the new tap room. Food can be brought in from nearby restaurants. Anticipated hours are: Monday-Thursday, 3-10pm; Friday, 2-11pm; Saturday, 1-11pm; and Sunday, 1-8pm. The new tap room will feature live music on Friday and Saturday nights at 6pm. 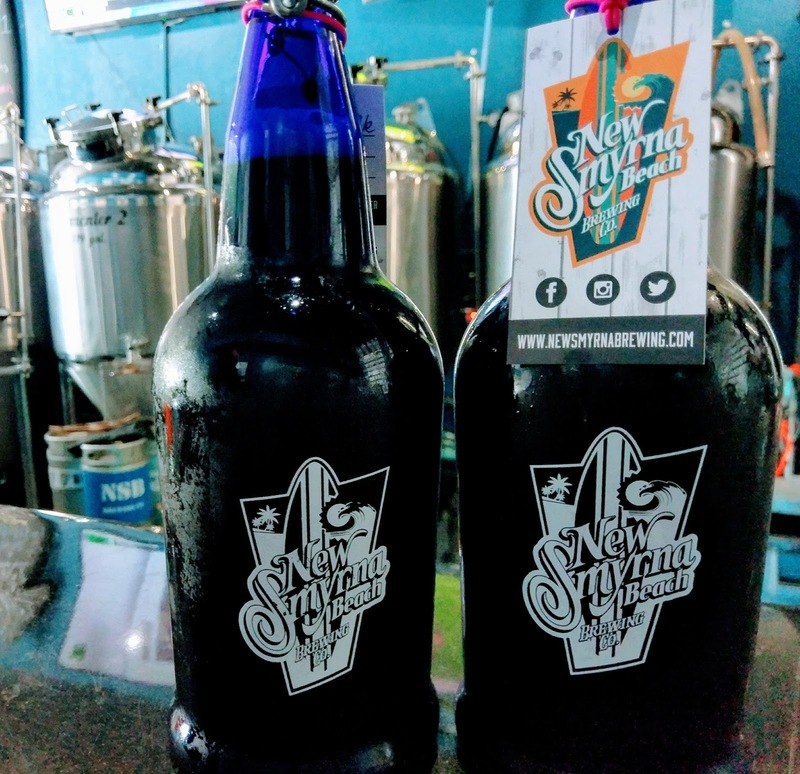 Congratulations to New Smyrna Beach Brewing! Thanks to Chris and Sara for the hospitality! Can't wait to see the new place in action. And, I think Jeff is going to like having all that room behind the bar. It's a cool spot. And, yeah, I might be looking forward to that Black IPA soon..... In the meantime, I don't think I'll have too much trouble finding a beer that I like in the new tap room.